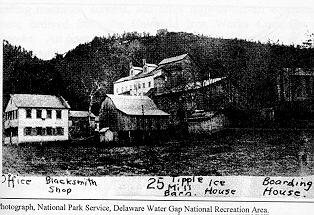 The Delaware Water Gap has a long history in both geological and cultural development. It is located in northwestern New Jersey (map 1). Today, the area is part of the Delaware Water Gap National Recreation Area. 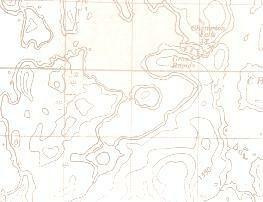 The location of Camp Pahaquarra was on the southern shore of the Delaware River, just downstream from Poxono Island (map 2). “When I first came this way, in the Spring of 1907, there was a great noise of blasting. The price of copper was up and some gentleman of persuasive ways, believing that the mining of this ore would pay, started a company, sold stock and erected buildings containing much machinery, when lo!, the price of copper dropped and another dream was busted. “Now all is as quiet as it was after the Dutchmen got through two hundred and fifty years ago. The two mine holes are a few hundred feet up the small brook that seems quite happy again as it is said to be of them. No one knows who the original miners were, but the supposition is that they were some of the earliest Dutch explorers who disappeared long enough before the first actual settlers came to leave no memory or legend of themselves that is founded on anything more substantial than air. The surroundings are romantic and beautiful in the extreme, and it is a wonderful spot for a person with a well-trained imagination, provided he is careful not to sit down on a rattlesnake”. In 1902, the Montgomery Gold Leaf Mining Company purchased 1,568.5 acres of the Pahaquarry tract. This company constructed impressive new buildings in a cleared area at the mouth of Mine Brook. Despite these efforts, the copper continued to be of low grade. In 1904, the Gold Leave Mining Company was reorganized under the name: Pahaquarry Copper Company and new state-of-the-art machinery was brought to the tract. This included a double track tramway, storage bins and crushing equipment. 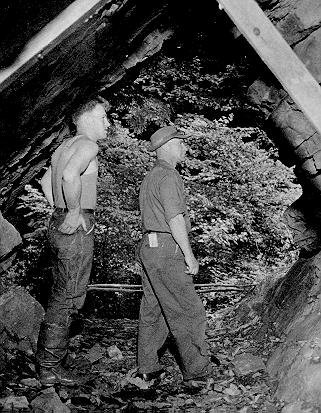 On May 20, 1925, the Pahaquarry Mine property was sold to the Trenton Council of the Boy Scouts of America. The machinery, including boilers, gas-powered dynamos, crushers, crushers, mining machinery, ore cars and tracks, was sold to a Newark scrap dealer. Zusman, Albert. 1999. 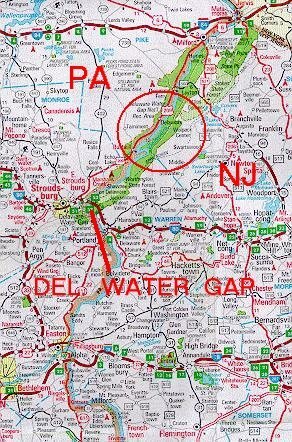 Boy Scout camps along the Delaware River; Spanning The Gap 21(2):1,4-5,8. 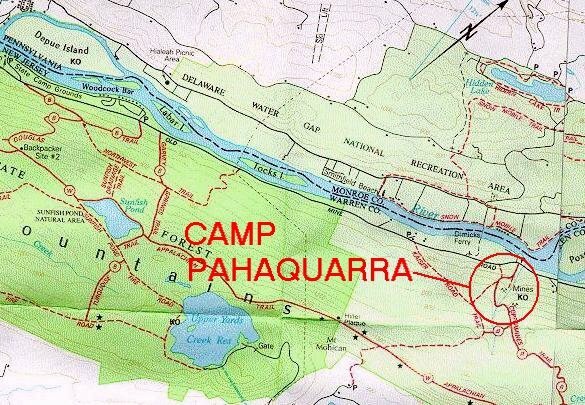 Camp Pahaquarra (later known as Pahaquarra Scout Reservation) served Scouts from 1925 until 1971. 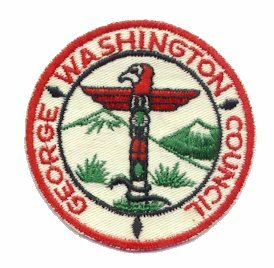 It was the first council-wide camp owned by the George Washington Council, BSA and the earlier councils (Trenton Council, BSA and Trenton-Mercer Council, BSA). Thousands of boys from Mercer, Hunterdon and Warren Counties came to the “wilds” of northwestern New Jersey for adventure, including hiking, camping, pioneering, swimming, canoeing and numerous other activities. As they developed these skills, they also learned about teamwork and leadership. Every so often, we are fortunate to find photographs of those early days. Camp Pahaquarra is most often symbolized by the totem pole which appears on the council patch. This totem pole actually did exist, standing proudly in front of the Pahaquarra Trading Post. The main part of camp spread out along Mine Brook, with campsites on both sides of the ravine. The waterfront area was along the Delaware River. 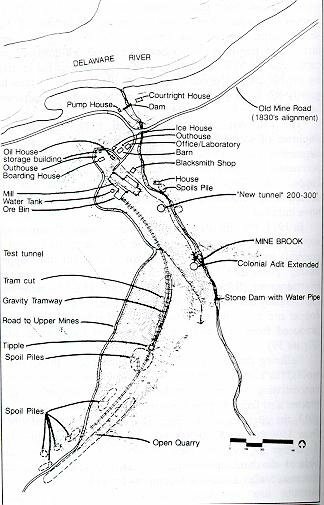 During the 1960’s, rumors began that the US Government was about to condemn all private property holdings along both shores of the Delaware River in order to construct the Tocks Island Dam Project. 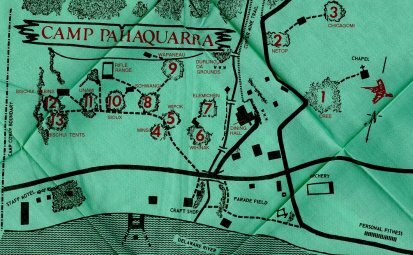 In the early 1970’s, rumors became facts and the George Washington Council was forced to sell Camp Pahaquarra to the government. We were not alone; other Boy Scout camps as well as farms and homes, were acquired by the government. 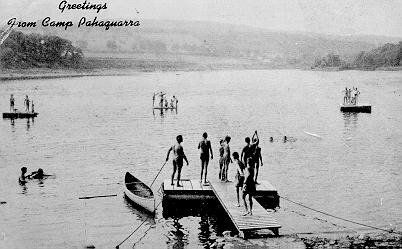 1971 was the final summer camping season at Camp Pahaquarra. 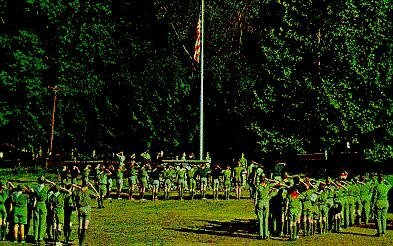 Immediately after the last camper left, the Council moved “over the mountain” to its new camp - Yards Creek Scout Reservation. The Tocks Island Dam was never constructed. Today, both sides of the Delaware River are part of the Delaware Water Gap National Recreation Area. The parade ground is now the Coppermine Parking Area. The buildings are all torn down, though the dining hall floor remains. Mine Brook continues to trickle along and the steps that descend to the tunnel used by thousands of Scouts to cross River Road (the Old Mine Road) are overgrown with moss. I visited the site in 1998, the first time in 25 years. I wandered around Camp Pahaquarra and looked at the foundation of the dining hall and the crumbling remains of the trading post. I climbed up the hill and found evidence of Cree and Netop campsites. I looked into the entrance to one of the copper mines and sat on a mossy rock that was once part of the Durling Ceremony Grounds. Everything was overgrown - not just with weeds or saplings but with large trees. Truly, many years had passed since Camp Pahaquarra had closed. I headed down to the waterfront. There was no indication that a cabin had sat on the banks overlooking the swimming area. 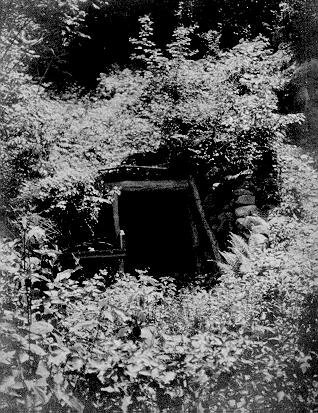 The only witnesses to the “old days” were the massive trees bordering the river and a single cement step along the path, before it dropped down to the shoreline. I sat on that step and tried to see countless Scouts swimming in the river, trying to earn a merit badge or simply trying to figure out how to inflate their pants to use as a floatation device. But all I saw were ripples in the river as fish rose to eat evening insects. I sat on that step and tried to hear my father playing the bugle “come and get your chow, boys, come and get your chow” from the Pahaquarra of 1943. Or maybe the sounds of the bolt-action .22’s up at the rifle range (10 shots for a quarter in 1969). But all I heard was the wind blowing through the trees. I sat on that step and tried to detect the faintest whiff of cooking from the dining hall - maybe bacon frying or cupcakes baking. But all I could smell was a piece of fresh mint that I had crushed with my boot. I sat on that step and watched the Delaware River flow slowly past me. I learned to swim and canoe in that river and I learned to be a boy and a man at that camp. But I recognized that my youth was just a fleeting moment in time for the Delaware, as was forty-six years of Camp Pahaquarra. But before I became too sad, I remembered I had one last stop to make. 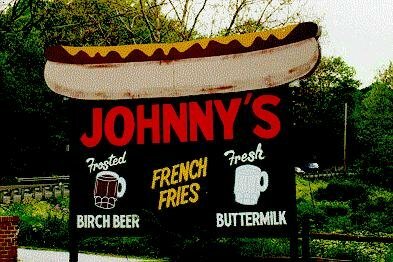 Just the thought of stopping at Hot Dog Johnny’s for a ‘dog with mustard and onions and an ice cold birch beer was enough to make me say “things are OK”.